Russia accused Israel of 'dangerous rhetoric' that could lead to a 'major war' as speculation grows over the possibility of a strike on Iran's nuclear reactors. A recently published report by the International Atomic Energy Agency revealed that Iran may be only months away from acquiring the ability to construct a nuclear device, thanks to expertise provided by Korean, Pakistani and Russian scientists. Israeli Prime Minister Benjamin Netanyahu has been contemplating ordering a pre-emptive strike against Iran's nuclear facilities. The Israeli PM is reported to have recently held a one-on-one meeting with opposition leader Tzipi Livni discussing such a scenario. Livni is said to have accused Netanyahu of hastening the commencement of World War III. Now the Russian Federation are blaming Israel for fomenting a “threatening atmosphere” that could lead to a “major war”. 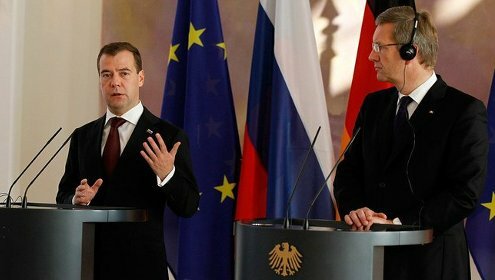 “Speaking in Berlin after meeting his German counterpart Christian Wulff, Medvedev said a threatening atmosphere was being created by the Israelis, as media speculation abounded that Prime Minister Benjamin Netanyahu and Defense Minister Ehud Barak were considering a military option against Iran. "The threat of a military strike could lead to a major war," he warned, adding that it was now vital to calm the situation, "take a deep breath and open talks." “For us, this is not a problem you can turn a blind eye to - one to be solved by small concessions. For us, it is a problem of whether our nation can ever recover its health, whether the Jewish spirit can ever really be eradicated. Don't be misled into thinking you can fight a disease without killing the carrier, without destroying the bacillus. Don't think you can fight racial tuberculosis without taking care to rid the nation of the carrier of that racial tuberculosis. This Jewish contamination will not subside, this poisoning of the nation will not end, until the carrier himself, the Jew, has been banished from our midst. “"On the anniversary of this regime, people demonstrated in various places, but there were dead and wounded and this regime once again showed its real nature," he said in a television interview. "Like a cancer cell that spreads through the body, this regime infects any region. It must be removed from the body," he added. As you can see, the time of the fulfillment of Ezekiel's prophecy is drawing near. Israel's neighbors, Iran (Persia), Turkey (Gomer, Togarmah), Libya, all prophesied to take part in this coming battle (Ezekiel 38:5-6), are growing more hostile by the day. But Israel hasn't threatened any nation. Israel could have wiped Egypt, Jordan and Syria off the map in 1967. They didn't, because they only sought to defend themselves from their attackers. Israel does not seek Iran's destruction, but they will defend themselves, even if that means having to strike first. Satan knows that if he can destroy Israel and the Jewish people he can nullify the promises of God and prevent the Lord's return to set up His Millennial Kingdom. That is why Hitler made the destruction of the Jews his number one priority, even while there was no state of Israel in existence. And that is why Ahmadinejad seeks to destroy Israel today. Praise God that Satan won't have the victory.